You'll trigger this quest at the conclusion of the quest The Ruins of Cilant Lis. For this quest you'll need to find somebody who can diagnose why you've suddenly started seeing and hearing things. You'll find some help -- in a way -- when you reach Gilded Vale. 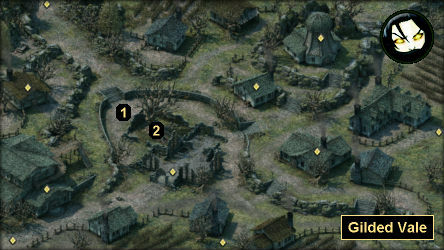 Shortly after arriving in the town, you'll spot a great tree filled with hanging corpses (#2), and you'll learn that the victims were executed by Lord Raedric after they failed to cure Waidwen's Legacy, which has caused babies to be born without souls. When you speak with Urgeat, the local magistrate (#1), you'll learn that one of the bodies on the tree belongs to an animancer, and he'll welcome you to go through her pockets. However, you won't be able to interact with the animancer's body until you've rested once. During that time, you'll have a dream about the animancer, and she'll call you "Watcher." When you return to the tree, you'll be allowed to communicate with the dead animancer, who you'll learn is named Caldara de Berranzi. She'll tell you that you're a Watcher, which means you can sometimes interact with souls, including those of the recently dead. At the end of the conversation, de Berranzi will direct you to seek out another Watcher, a man named Maerwald located at Caed Nua to the east.